August 6, 2017 ~ Atlas Shrugs? 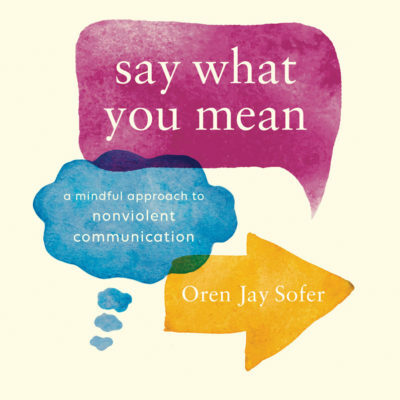 How does your awareness of the living-energy of needs factor into your practice of nonviolence more broadly, such as with social change agency (i.e. how might it be utilized as a resource for a more mindful existence within a larger, societal context)? How does engagement with the world at large influence you as a practitioner of Nonviolence/NVC? What keeps you from moving forward (with reference to your issue/concern)? What support do you need to go forward? What beliefs might keep you from changing or going forward? The four stations of Joanna Macy’s Spiral of the Work That Reconnects are deliberatively a part of how our call is constructed, however the spiral can also be used with open-ended sentences, dyad work, etc. to deepen our engagement with things that we might ordinarily glance past. As indicated in the opening inquiry, we will identify the qualities of needs as a generative resource (a dyad practice). I’ll offer more details during the call, however it mostly entails allowing the spaciousness — to both ourselves and others — to apprehend a need in the same way you might during a wine tasting gathering (with each swooshing it about, discerning its distinctive qualities, breathing in its aroma, etc. — this works both when someone prompts us to flesh out a need that they themselves name and/or when we choose one and then describe, even free-associate, while in the presence of another. Lastly, to place this building of a “need connoisseur” muscle in context, it’s also useful to identify a troubling scenario and infuse one’s recollection with the qualities of whatever need wasn’t attended to, in that moment. Imbibe of the memory of this event, while infused with the living-energy of need(s). We’ll link our practice of apprehending mourning/beauty of needs with an exploration of Nonviolence — the tradition from which NVC stems — in the context of social change [agency — specifically vis-a-vis Joanna Macy’s work, as it relates to the environment]. 21st Cenurty as the Age of Outrospection? What follows is an example of “celebrating judgments” or “enjoying the jackal show” (in order to surface what is being valued, in this instance, by me). FYI ~ Near bottom of this post, just beneath the next drawing of a gadfly, you’ll find more on Joanna Macy’s Spiral of the Work That Reconnects. It quickly became a lightning rod, as the most read article in the magazine’s history while sparking an ongoing debate as to the merits of the piece, i.e. accuracy, validity, contextualization, etc. 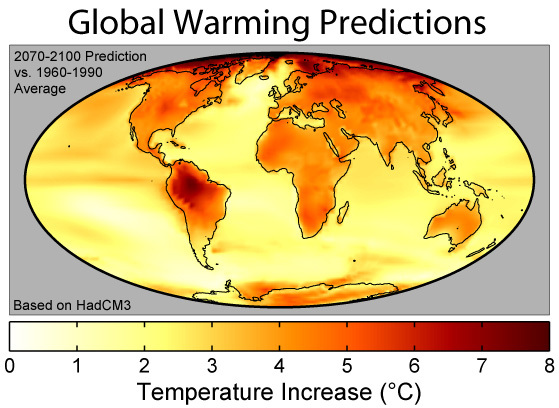 (amongst the community of climatologists and climate change communicators): see WaPo — Scientists challenge magazine story about ‘uninhabitable Earth’ & Did that New York magazine climate story freak you out? Good. – Vox for more. This is an extremely unusual, perhaps unprecedented step towards full “show your work” transparency for us. We’re doing to the atmosphere today what cataclysmic volcanoes did 250 million years ago. “Who looks outside, dreams; who looks inside, awakens,” Carl Jung famously said. Philosopher Roman Krznaric believes that the 21st century needs to shift from introspection to outrospection, the ultimate art form for which is empathy. In video clip above he unpacks . . .
Excerpt: …Governing today is all about how you prepare your society to get the most out of these three climate changes and cushion the worst. Sadly, that’s not our society’s priority right now. In the age of Trump we are treating governing as entertainment. Which brings me to China. China takes governing seriously — in a cruel way and in an impressive way. Its leaders wake up every morning and ask themselves two questions. First, how do we stay in power? Their answer, which I find reprehensible, is: We’ll use technology to repress our people. I think in the long run depriving China’s people of freedom, a basic human right, will undermine their ability to realize their full potential. But it has worked better than expected, up to now, because China’s leaders are just as focused on asking a second question: What world are we living in? Which leads to: What are the biggest forces shaping this world? And what kind of national strategy do we need so our people can get the most out of these forces and cushion the worst? They know we’re in the midst of these three climate changes and have formulated a strategy — “Made in China 2025” — to thrive within it. It’s a plan for building the infrastructure, investments, education and regulations that will enable Chinese companies to lead in supercomputing, new materials, computer-controlled machine tools, industrial robotics, space and aviation equipment — including drones — clean cars, clean energy, biomedicine and next-gen medical devices. Only time will tell how much what China has wrong about governing will undermine what it has right. By contrast, Trump hasn’t even named a science adviser. He pulled out of the Paris climate accord without any input from scientists, and he proposed a budget for fiscal 2018 that eliminated the Department of Energy’s innovation lab (the “Advanced Research Projects Agency — Energy”) and slashed funding for all of our key national science and medical labs, which provide the basic research for the very next-gen technologies in which China is now massively investing. He’s spending the money instead on a wall against Mexico. Is there anything more stupid? 07:04 Charlie Rose: Yes. And can you argue — can you make the argument that over the long run, whatever the long run is, those countries that don’t have a highly functioning democracy will be, in the long run, restrained, in terms of their prospects? 07:25 Jeremy Grantham: That’s certainly a widely-held view. 07:46 Charlie Rose: Economic systems. 07:47 Jeremy Grantham: — economic systems. But, one or two things it does very badly, if it’s very long-term, capitalism is not really suited to that. They have this discount rate problem whereby anything that happens out 20 years doesn’t seem to matter. 08:56 Charlie Rose: Before you say that, they have a much greater respect for science. 09:00 Jeremy Grantham: Yes, they do. The Chinese regime before this one had nine out of the top 10 guys had PhDs. And so I went to a little trouble to find out how many PhDs we had in the whole of congress all the way up to the presidency. And the answer came back, maybe one and a half depending on how you view doctorates. 09:24 Jeremy Grantham: This is a fairly tragic comparison. 09:25 Charlie Rose: It certainly is. What keeps our society/civilization from moving forward? What societal awareness would be supportive in this regard? 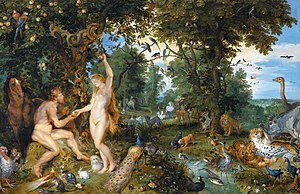 What beliefs might keep us as a society &/or civilization from changing or going forward? Statue of Atlas in Rockefeller Center on Fifth Avenue in New York City, opposite St. Patrick’s Cathedral. Frank Jacobs (continues later in the article): “…This blog is about maps, and is not concerned with the literary or philosophical merits of Ayn Rand’s work. Yet there is a cartographic connection. The title of her book came to mind when we came across this image of Atlas – standing on the world rather than carrying it, propping up the heavens, not the earth. This Atlas is an anti-version of our standard concept: the Atlas who carries the weight of the world, and is compelled to shrug off that burden by Rand. This Atlas is from the frontispiece of Frederik De Wit’s 150-map Atlas (Amsterdam, ca. 1688). His hands seem to clutch at a low ceiling. He looks like he’s uncomfortably wedged between the North Pole and the celestial dome above him. Is he pushing the sky up, or the world down? 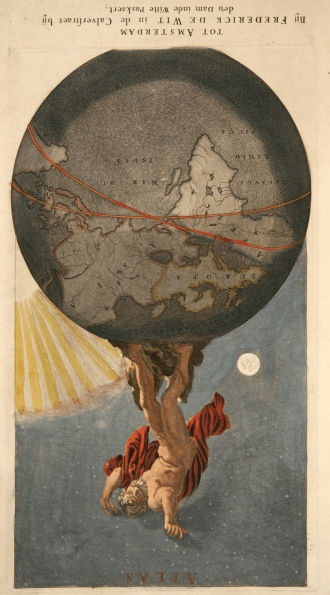 From Frederik De Wit, Atlas Standing on Earth, Holding up the Heavens. To make the image even weirder, turn it on its head. Now Atlas is down and the world is up, as we imagine they should be. But the planet-lifter is face down, standing on his head. Balancing himself with his hands, he props up the earth with his feet like some circus act, or like Medieval scholars believed their antipodes to walk on the other side of the earth. Who was right, Ayn Rand or Frederik De Wit? Who is this Atlas character anyway? “We have so much to do, and we must do it together,” the pope said during his nearly 18-minute talk. The Achilles heel of welfare economics is its treatment of externalities. … In a market economy any action of one individual or enterprise which induces pleasure or pain to any other individual or enterprise and is under or over priced by a market constitutes an externality. Since the vast majority of productive and consumptive acts are social, i.e., to some degree they involve more than one person, it follows that they will involve externalities … If we assume the maximizing economic man of bourgeois economics, and if we assume the government establishes property rights and markets for these rights whenever an external diseconomy is discovered [the preferred ‘solution’ of the conservative and increasingly dominant trend within the field of public finance], then each man will soon discover that through contrivance he can impose external diseconomies on the other man, knowing that the bargaining within the new market that will be established will surely make him better off. The more significant the social cost imposed upon his neighbor, the greater will be his reward in the bargaining process. It follows from the orthodox assumption of maximizing man that each man will create a maximum of social costs which he can impose on others. Ralph d’Arge and I have labeled this process ‘the invisible foot‘ of the laissez faire … market place. The ‘invisible foot‘ ensures us that in a free-market … economy each person pursuing only his own good will automatically and most efficiently, do his part in maximizing the general public misery. … To paraphrase a well-known precursor of this theory: Every individual necessarily labors to render the annual external costs of the society as great as he can. He generally, indeed, neither intends to promote the public misery nor knows how much he is promoting it. He intends only his own gain, and he is in this, as in many other cases, led by an invisible foot to promote an end which was no part of his intention. Nor is it any better for society that it was no part of it. By pursuing his own interest he frequently promotes social misery more effectually than when he really intends to promote it. Note the chair at opening of this Interview (w/ Quilt)! …Republicans are not idiots. On the Senate Armed Services Committee, they hear the military warn of climate change as a catalyst of conflict and a threat to low-lying military bases such as Norfolk and Diego Garcia. At their home-state universities, they see climate science in action. Those with coasts see sea levels rising and fisheries going awry; those with forests see pine beetles spreading and wildfires raging; those with farms see unprecedented drought and unprecedented cloudbursts. Republicans hear about climate science from national laboratories and national science and health organizations. They see overwhelming polling numbers showing young voters — even young Republican voters — in favor of climate action. Rosencrantz: I don’t believe in it anyway. Guildenstern: Just a conspiracy of cartographers, then? I do want to say a few more words, though, about good faith. The response has been remarkably positive, but, as anyone reading these tweets knows, there has also been some pushback from scientists. Climate change is a terrifying threat to the way we live on this planet, and these are the people to thank for that knowledge. Their knowledge, and their work, enables us to act. Without their insights and their guidance, we’d be truly flying blind. In a very literal sense, we have them to thank for the lives of our children and grandchildren. …hoping that the public would pay more attention to the threats they saw first. Work That Reconnects Network — Take part in the healing of our world! For more about Joanna Macy and her work, her site is a great starting point (and this interview is helpful too). This is a blog about strong emotions and how these impact our actions. 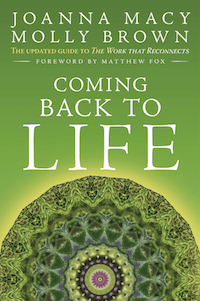 I was inspired to write it by my encounter with ecopsychologist, Buddhist scholar and activist Joanna Macy – a woman who has pioneered working with despair since the 1970s. Despair in this blog will refer to a combination of feelings including grief, anger, powerlessness and fear. It is not surprising for me that despair is so common to people in my periphery. Those attempting to confront injustices are fighting an uphill battle in this political context. Meanwhile, we witness with horror the ineffectiveness of our work as disaster capitalism continues to be so reckless with the climate, the rest of the environment and the wellbeing of the vast majority. a. Where does despair block you from full power in your work? b. How can you support each other in facing and embracing the despair to find the core of care in it? a. What judgments of others do you have that interfere with your ability to reach and connect with them? b. How can you support each other in transforming those judgments and opening your hearts? a. In terms of lining up with the goals and vision you have for yourself and for your projects, where are you in relation to the steps of change? Are you aware enough of alternatives? Do you have sufficient trust in your capacity to create the change? Are you afraid to step forward even though you have clear ideas about how to move? b. How can you support each other in moving forward towards change? Why is Trump hollowing out the State Department? This entry was posted in Beauty/Living-Energy-of-Needs, Mindfulness, Nonviolent Communication (NVC) - Resources and tagged 3Chairs, NVC. Bookmark the permalink.